Explosion Box 3 - Disney! After such a looooong wait, here is the last of the three explosion boxes I made THREE YEARS ago! I love this one SO MUCH! It's theme is Disney and it's bursting with precious memories and pictures of my girls and I at Disney. Since I don't share their images on line, my pictures of the box won't be as pretty, but you all have loved ones too so I know you understand. 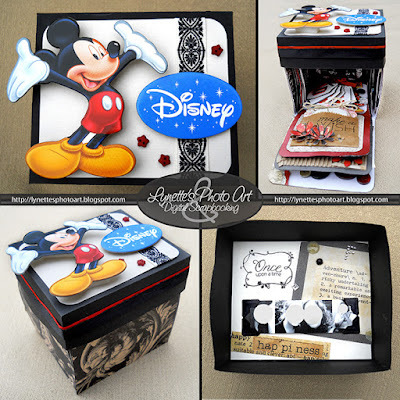 The top of the box has Mickey and a Disney disc of thick cardboard along with a grosgrain ribbon and tiny red star buttons. For an extra surprise, I decorated the inside of the lid too this time with stamps, photos in photo corners, rhinestone family initial, button, 3D button sticker, rhinestone, scraps and a 3D clear happiness sticker. And here's a peek inside! This box has two photo rings. One I put photos on and left the backs for her to journal. The second one I spelled out Disney with puffy, shiny stickers, leaving the backs to be personalized. In the upper left photo, the top page is a photo on a stack secured with picture corners. The left page has a grosgrain ribbon decorated with a paper flower with a red rhinestone brad center. A mounted photo is tucked behind the ribbon and rich red hearts rhinestones finish it off. 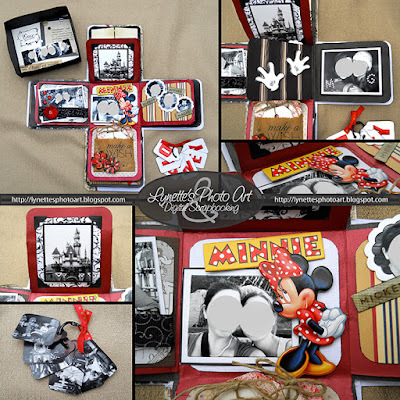 The middle page has a Minnie and name plate of thick cardboard and a photo on a stack. The page to the right has photos with scalloped white frames and 3D glossy word stickers. The bottom page has a tiny brown paper bag with tags tied with jute tucked inside. They are stamped and decorated and one has a photo with the backs for journaling. The bag is stamped and has two large paper flowers and two tiny paper bag flowers with 3D glossy centers. 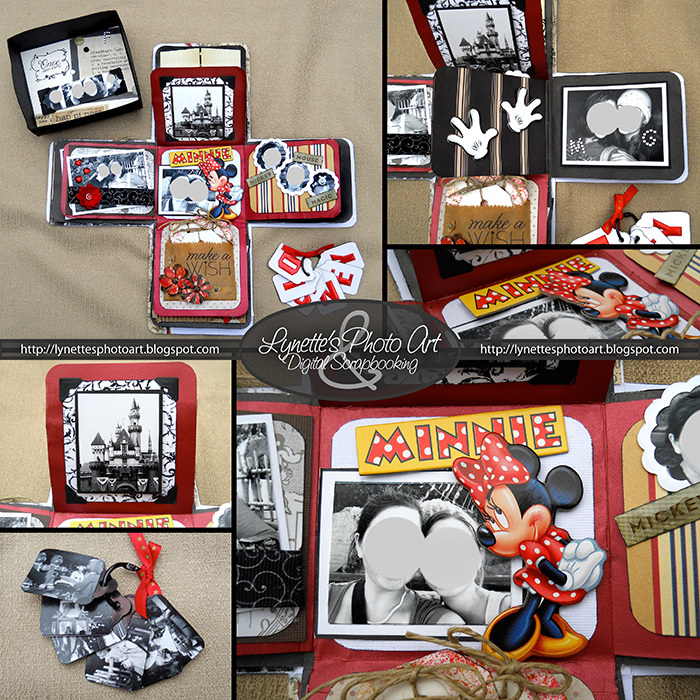 The upper right photo shows thick cardboard Mickey hands on one page and a photo mounted on a stack and finished with rhinestone initials. LOL guess I pretty well covered all this above, but you can see it better here! In the upper right photo you see a page with flocked "doors" with brad door knobs. When you open them you see the upper left photo. It's mounted photos have black and silver rhinestones. Back at the upper right photo, the page below the "door" page has two crocheted ribbon bands to tuck pictures mounted on stacks behind. The lower left photo shows the top page with torn papers, two photo strips mounted on stacks, a thick cardboard mouse head and rhinestones. Below it is a photo mounted on a stack. The lower right photo shows mounted photos on both pages. One page has a paper flower with a rhinestone center. The other page is flocked and adorned with rhinestones. The upper left photo shows a page with photos on stacks. There is a tag tied with jute tucked behind a photo used as a pocket. The upper right photo shows the two sides of the tag. The lower photos show a page that uses a photo itself as a pocket and has there photos tucked into it, two of which are framed. It also has a clear 3D sticker. The upper left photo is so cool! The page off to the right is again a photo mounted on a stack tucked under grosgrain ribbons secured with black brads. A ribbon is adorned with a photo in a white scalloped frame and a clear 3D dome on top of it. Ok that was cool, but the page to the left of it is really fun! I used the envelope a store gift card would come in as a picture frame. In the lower right photo you see when you lift the envelope! I decorated the flap with a photo mounted on a stack and an decorated with a button, a rhinestone, a red bugle bead, a red sparkly foam circle and a thick cardboard star. On the back of the "picture frame" I put a Mickey name sticker bordered by rows of 3D flocked sparkly dots! So fun! You really can use about anything around the house when you make these! 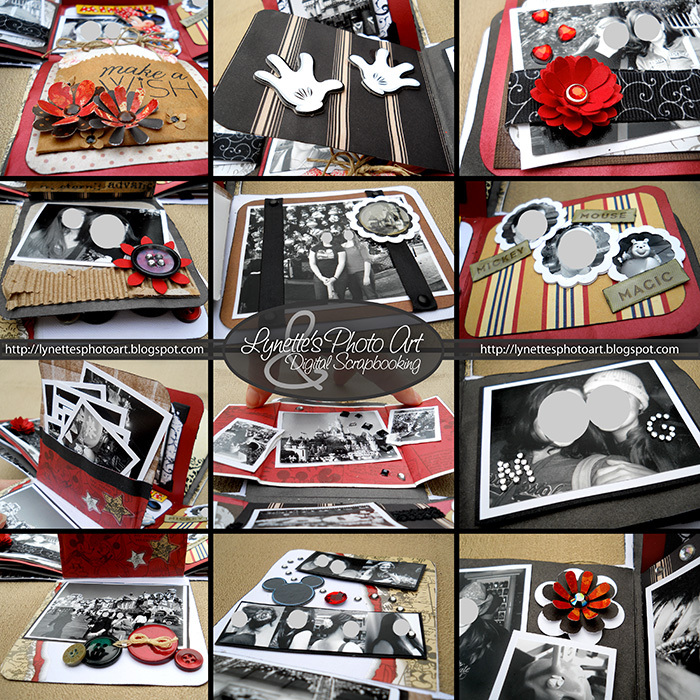 In the upper right photo is a page with tons of mounted photos tucked into a pocket with stickers and ribbon on it. The page below has a mounted photo finished off by buttons and a floss bow. 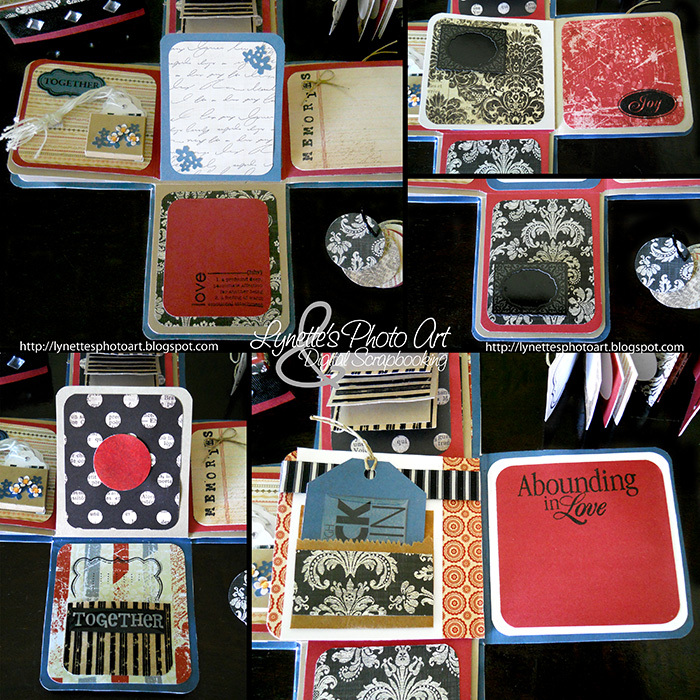 In the lower left photo the upper page has a photo in a red scalloped frame on top of the other goodies. The page beneath it has a mounted photo tucked behind cardboard I tore from a box. Love the texture! There's also a flower made from paper and a button topped with rhinestones. This is a collection of fun close up shots showing the dimensional accents of some of the pages, which is half the fun anyway isn't it? I hope you enjoyed these amazing explosion boxes as much as I have. If you want to make one of your own, there are lots of Youtube tutorials out there. The only part I think a tut would help is in understanding that each of the three layers of "pages" are a bit smaller than the one under it so that it all folds up happily into the lid. After all, when you are done you will have added lots of thickness to the pages, so they can't all fold up right against each other!!! The sky's the limit with these little treasure boxes. I especially love using things that are already around the house or would have been thrown out. Up-cycling things is so satisfying!! I gave this one to my other daughter. If you missed the box for my other daughter and my sister, they are here and here. Each one is sooooo different from the others - just so fun!! LOL it may have taken me three years to get the posts finished, but doing the posts has made me think I might just need to make another one now! Hmmmm....who do I know that needs a happy explosion box...? Thanks so much for stopping by and have a great day! Explosion Box 2 - Grungy! After such a looooong wait, here is the second of the three explosion boxes I made THREE YEARS ago! I love this one too. 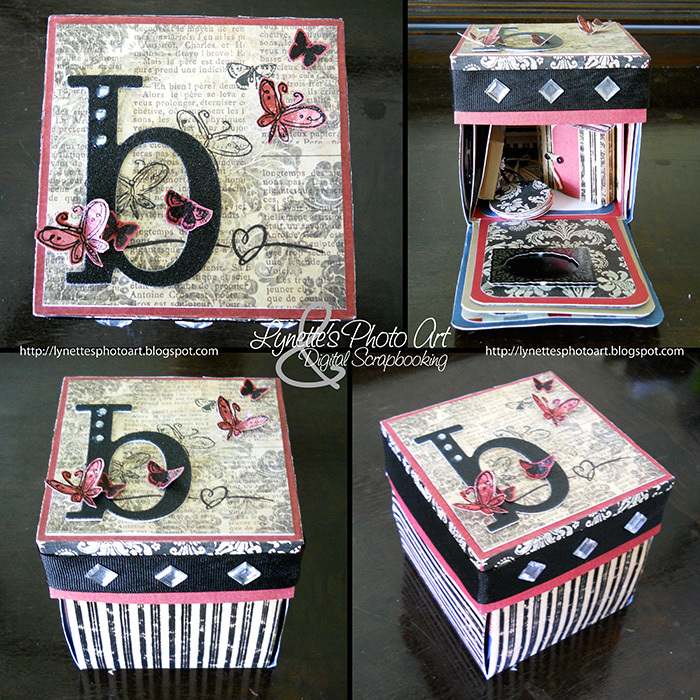 It's a grungy box I made for my sister. Since I don't share their images on line, my pictures of the box won't be as pretty, but you all have loved ones too so I know you understand. The top has a chunky, textured initial embellished with rhinestones. I stamped the butterflies on the paper and also a red paper which I cut out and attached as 3D interest. There is grosgrain ribbon with rhinestones on the sides of the lid. The body of the box is too fun - it's FLOCKED! Here's a fun peek inside at the goodies! You are seeing a ring of discs of scrap paper which she can add photos and journaling to the backs. I made another of my precious tiny picture albums to tuck inside. The little book has a cover of flocked paper and closes with floss wrapped around black brads. She can slip a photo behind each of the round frames and journal about them on the page facing the photos. I just LOVE these little books! In the upper left photo you see a brown box I made and tucked a bunch of white tags into. Each of those tags have the face and name of someone she loves on them. She can write on the backs. The box is decorated with more of the plastic cup flower punch outs I mentioned in my last post and some tiny paper flowers with rhinestone centers. 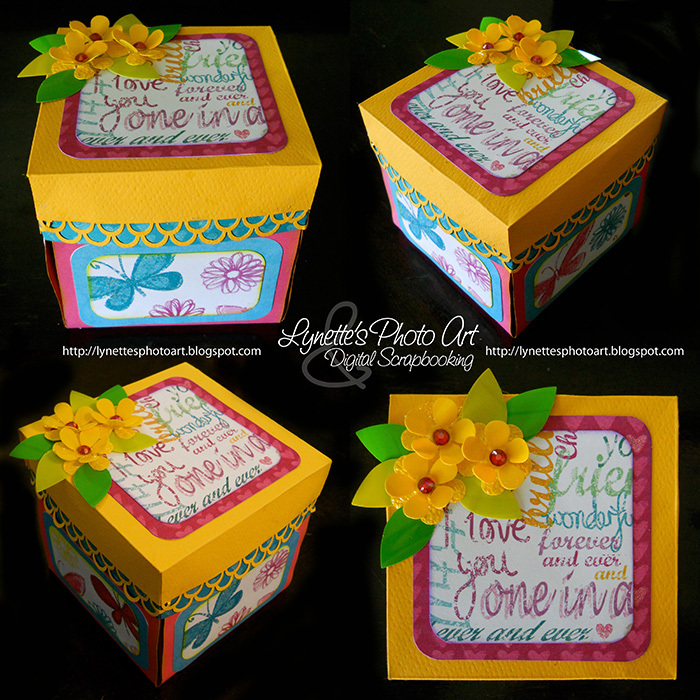 The tutorial for the plastic cup flowers is here and another explosion box I made featuring them is here. 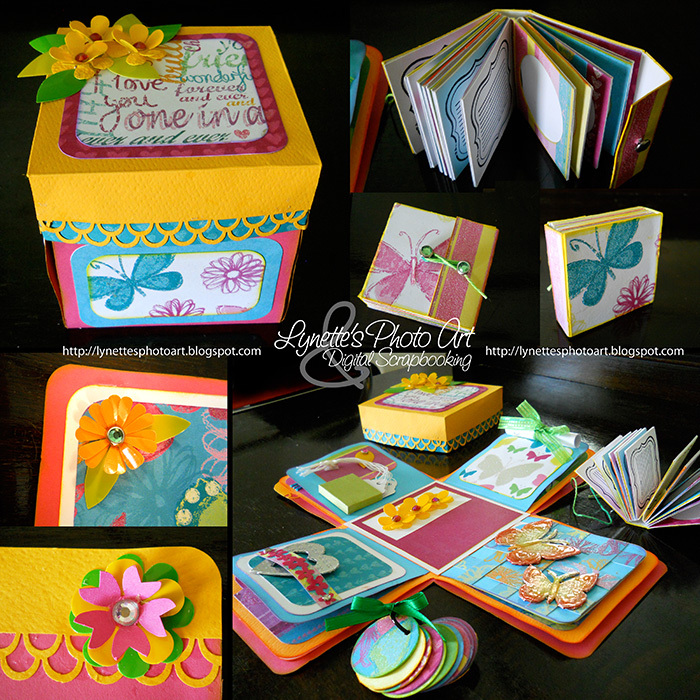 I also have a digital scrapbooking kit of these 3D beauties available here. 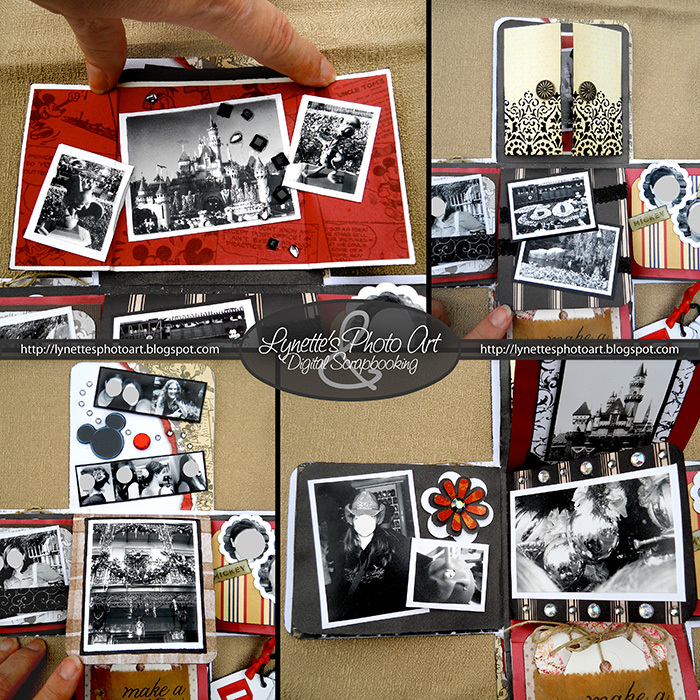 There is a black photo frame on the bottom page, and on the top page there are four flaps (flocked!). 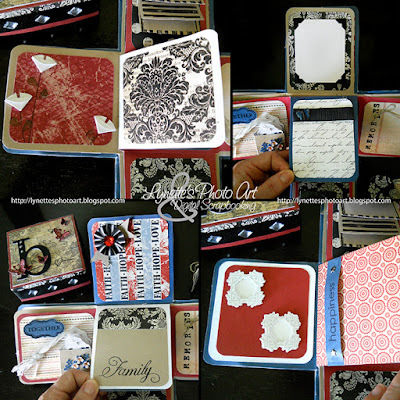 Two flaps are blank to add a photo or text and the other two she can add to the back sides. 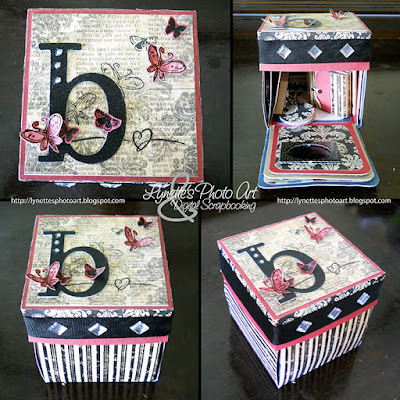 The center page features an old book page accordion folded into this rosette topped with an antique button and jute bow. Here you can see the photo tags and box better. The faces are hidden as I explained above. These really are adorable and so is the little box. The tag on that page says "together" and is stamped and embossed and mounted on a piece of double stick foam to give it height. The upper left photo features tiny white origami flowers I folded from circles, and stamped stems and leaves. 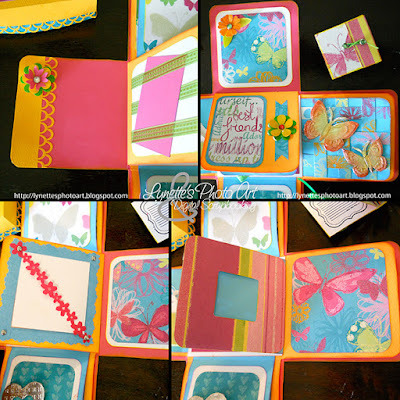 The upper right photo shows a card mounted with photo corners. 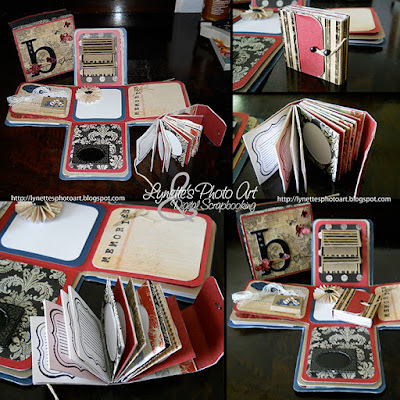 She can add a photo or journal on it...or both! Below that is a page with a ribbon band to tuck goodies under, embellished with an enamel metal butterfly that I removed from an old earring. 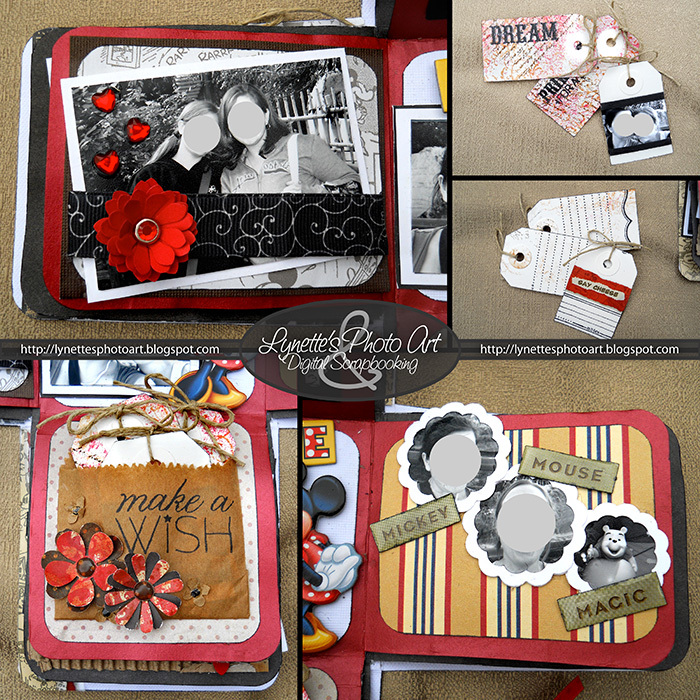 The lower left photo shows a rosette made from ribbon with a big rhinestone center and paper ribbon underneath. The page below it has a large pocket stamped "family" to tuck things into. The lower right photo has two tiny white picture frames on one page and a band with star brads to tuck things under on the page facing it. In the upper left photo you see more plastic cup flowers. In the upper right photo, two more tiny black picture frames. The lower left photo has a flocked pocket with a sticker on it. The lower right photo has a paper bag pocket with a tag inside that has a clear 3D sticker on it. There is also a ribbon band to hold things at the top of that page. So there is another example of the many things you can do with an explosion box! I really put a lot of time and love into making this for my sister and I love how it turned out, but this story has no happy ending. I have never had an experience like this before. When it didn't arrive at her house, I contacted FedEx. After many calls and tons of phone time, I was told they could track it to Nashville, and then it "didn't exist" any more! No further explanation was ever given, only that it doesn't exist any more. So, I zipped photos I had taken of it and e-mailed them to her so she could at least see what her gift was. It was indeed sad, but life goes on! 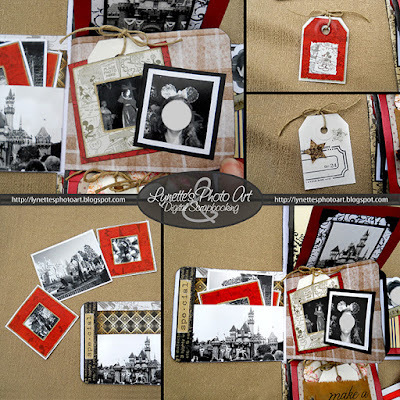 Thanks for stopping by and I hope you come back for the third explosion box - it was Disney themed and oh so cute! Have a great day! UPDATE: I have gotten all three boxes posted and you can see the other two here and here! Explosion Box 1 - at last! Tonight's a BIG victory for me! I have had this post partially done for THREE YEARS and tonight I've finally finished it! Don't you just love explosion boxes? They are so fun and full of surprises! Well, I made three of them in 2012 and always meant to share them, but never managed to find the time to finish this first post. Tonight I FINALLY have one of them to share! If you follow my blog, you might remember seeing my tutorial on turning plastic cups into beautiful 3D flowers. 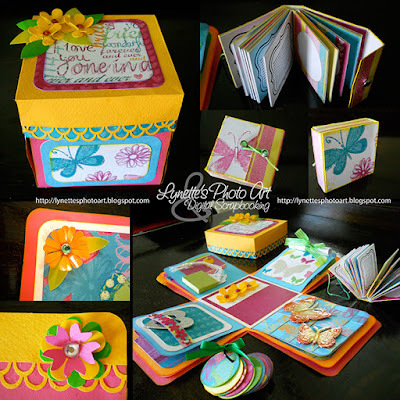 I have made a digital scrapbooking kit of these 3D beauties too that's available here. I knew I'd find something to use them on and this was it! 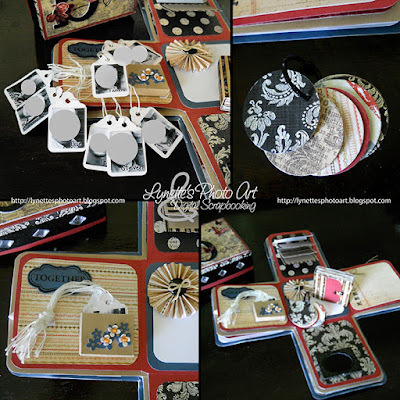 I love how all the plastic cup elements add such a different flavor and texture to my scrapping, and they didn't go into the landfill! Can you spot all the shapes I punched from the plastic cups? Here are the first plastic cup flowers! They have rhinestone centers. The lower set of petals have a marvelous bumpy texture and the top petals are smooth. I love that! I just punched them from different areas of the cups. The leaves are made from the cups too. You can't tell from the pictures, but some of the text and graphics in this paper set have a delightfully embossed subtle glitter accents! Among the tons of delightful surprises throughout the box, look at the tiny book I made and left loose inside the box when it's closed. Every page has an oval picture frame. 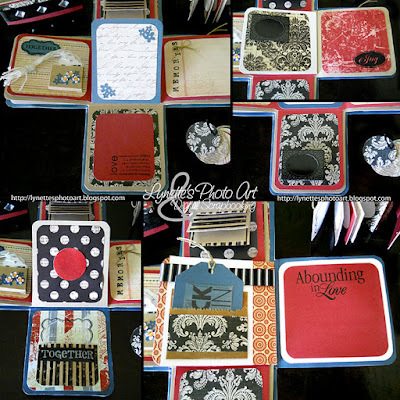 Slip a photo into the envelope from the top and add the journaling on the page facing it. Wrap the green floss around the two rhinestone filled brads to close the book. Too sweet!!! The discs on the ring have paper on one side and are white to add your photo on the other side. The little green pocket is filled with white tags to attach your photos too on one side and journal on the backs. In the center is a row of plastic cup flowers with rhinestone centers. There is a yellow plastic cup petal on the page to the left attached with a pink rhinestone filled brad. The page to the right is woven strips adorned by butterflies that I colored with ink sprays and finished with 3D gloss. The page to the top has a scroll for photos or journaling as you wish rolled up and secured with a green bow. The bottom page has an embossed aluminum foil covered heart shape tucked into a strip of flowers punched from plastic cups. A photo could be tucked in behind it. The two flowers in the lower left corner are made of plastic cup punches and rhinestones. 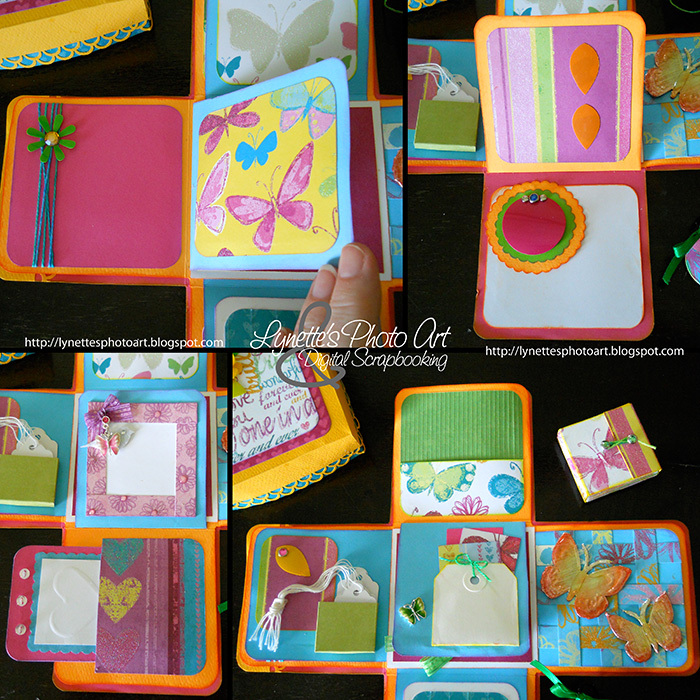 In the upper left photo you see a pink page with blue cording to tuck photos or other treasures underneath. It is finished with a plastic cup flower with a yellow rhinestone center. In the top right photo we have two plastic cup petals on one page and a stack with a plastic cup disc on top attached with a green rhinestone filled brad and gold brads to it's sides. The lower left photo has a pink picture frame to slide a photo behind, decorated with a ribbon bow and pink rhinestone and enamel butterfly dangle. 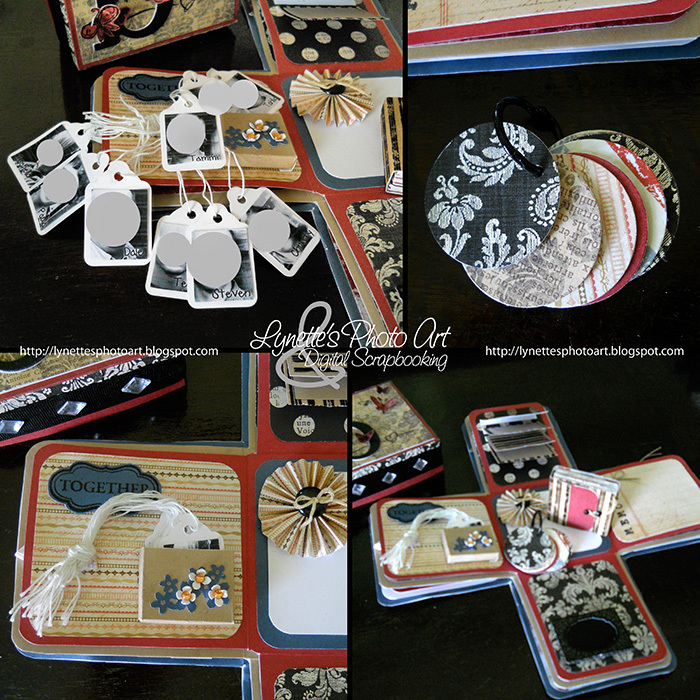 When scrapping, think out of the box and use bits and pieces of things you've saved. All the metal enamel butterfly elements I used were parts of old earrings. Lovely touches and they didn't cost a thing! Beneath that is an embossed card with baby buttons sewn to it that tucks away out of sight. The lower right photo has a pocket made from a large white label in the center. 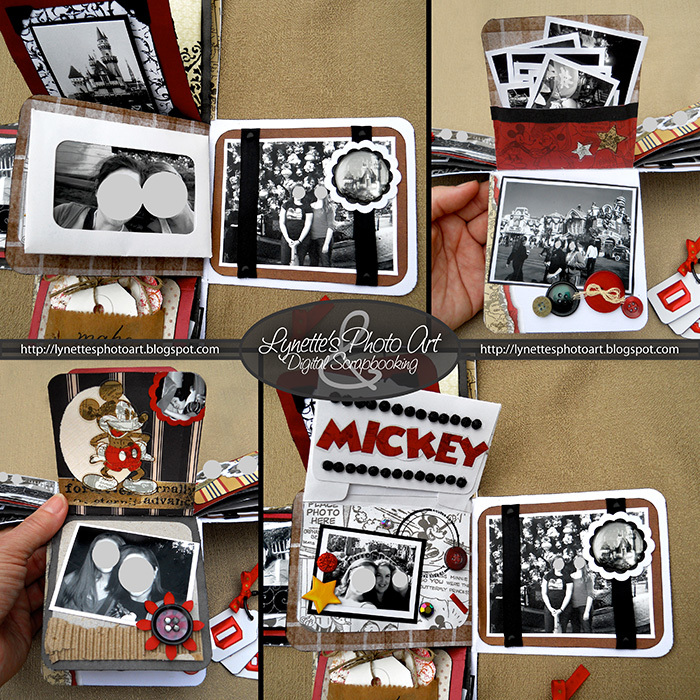 It's stuffed with cards to add photos or jouraling to the backs. There is a green enamel butterfly next to it. Above it is a butterfly pocket for photos and goodies to snuggle into. The upper left photo has more scalloped punched trim with a plastic cup flower and rhinestone center. Across from it is a page with ribbons to tuck photos behind and a journal card. The upper right photo features more plastic cup flowers. The lower left photo has a strip of flowers punched from a plastic cup attached with brads to tuck photos behind. The lower right photo has another picture frame to slip a photo behind. I'm not sure all the details are shown, but it gives you an idea of the possibilities. Truly, they are endless! I love how it turned out. It's bright and cheerful and filled with fun secrets to discover. I gave it to my daughter who I'd describe just the same way! I still want to share the other two boxes, but it's 1:30 in the morning and I need to head to bed! I'll see if I can't share them sooner than another THREE YEARS!!!! :) Hope you enjoyed it and thanks for stopping by! If you want to make one, there are tons of Youtube videos on it, but the only part that you might need it for is to show you that each of the three layers need to be a little smaller than the one before it, so it all folds up nicely once you have filled it! And of course they are good for getting ideas! TTFN and God bless you!